Rivini Priscilla lace ivory/white, fit and flare dress. Worn once and in very good condition. Corset bodice with a mixed lace media-absolutely beautiful detailing! I absolutely loved this dress more then anything and I hope someone else can enjoy it on their special day too! It was extremely comfortable, easy to dance in (I danced all night), and lightweight. It is just simple and stunning! I did not change the look of the dress one bit. I had it altered to fit my body. 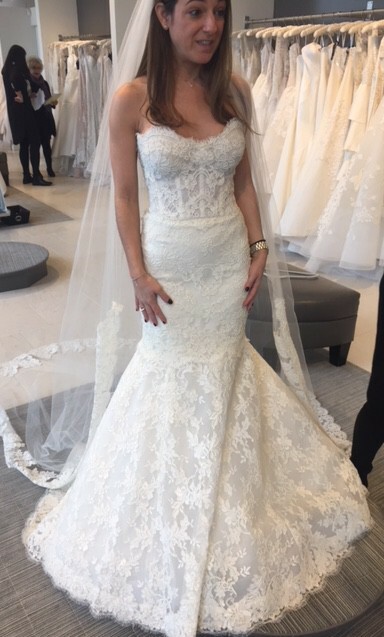 I am 5'0 but wore 5 inch heels with a 1 inch platform, so the dress is altered for a 5'5 height. The dress was dry cleaned, boxed, and preserved right after the wedding. It looks brand new.